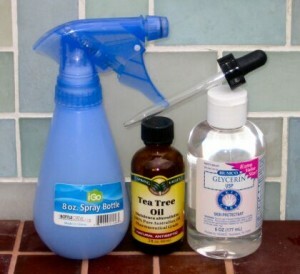 Use these supplies to mix your own moisturizing hoof disinfectant spray. This gentle, simple formula for a moisturizing spray disinfects, deodorizes, and softens a horse’s hooves prior to trimming. Helps treat and prevent thrush. May also be used as a wound cleanser. You can find these ingredients at health food stores, pharmacies, and the health and beauty aids department at most larger WalMart stores. Ask a pharmacist for a dropper top for the tea tree oil. Pour 6 oz of water into the spray bottle. Add 1 oz (1/8 cup) of glycerin. Add 10 drops of tea tree oil. Shake before each use. Caution: Tea tree oil may cause contact dermatitis (skin irritation) in sensitive individuals, both horses and humans. Do not take internally. Always dilute tea tree oil before applying. Adjust amounts of tea tree oil and glycerin as needed. For stronger antibacterial and antifungal action, double the amount of tea tree oil. Tea tree oil will damage the rubber bulb of most eyedroppers, so hold the dropper vertically and don’t allow the oil to contact the bulb.